Each level starts like this, I only realised after 4 hours of play time that you could right click to skip it. McPixel was raved about years ago due to the developers choice to help and support people who had pirated the game through the Pirate Bay, and after it being on the Steam Summer Sale for only £0.59, I really couldn’t miss the chance to give it a go. 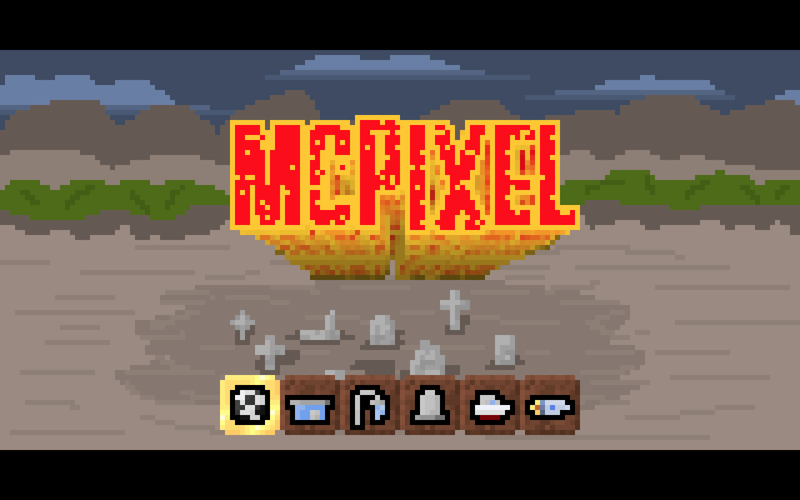 McPixel starts as it means to go on: by making you click all over the screen in order to progress through the game. It’s the same as how you’d play a classic adventure game, so it’s pretty simple to grasp. 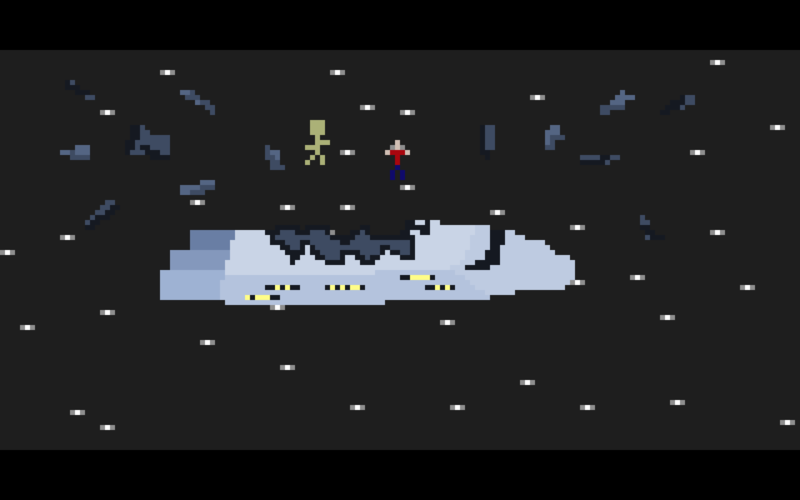 McPixel is a bomb expert that needs to save the day in many different circumstances. Sometimes the bomb is in plain sight, other times it’s hidden, at the end of the day your job is to find the bomb and defuse it within 20 seconds. This is all you’re given at the start of this level, so not knowing where the bomb is, what do you do? 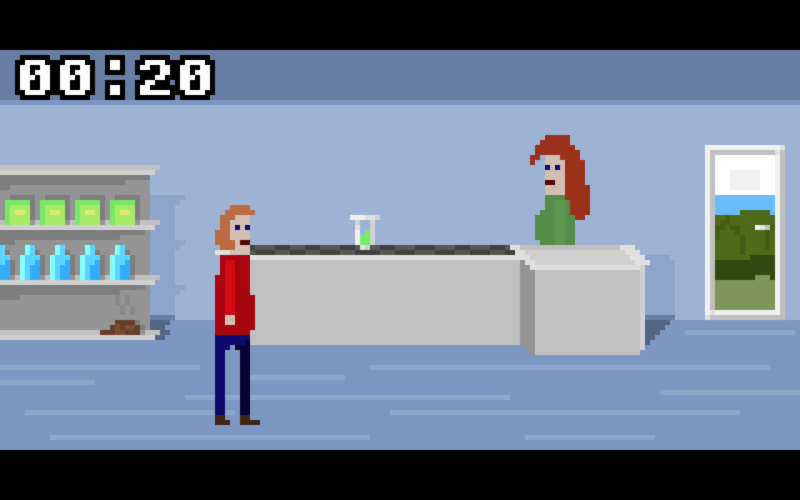 I didn’t mention that McPixel is hilarious and damn right random. Some solutions require you doing things that you’d think have nothing to do with the bomb, others are just down right rude or silly. The example above with the acid, poo and woman at the end, is solved by picking up the acid, and throwing it on the woman. It may sound random, but the bomb is inside her, and by doing what I just said makes sure that the explosion stays just within her belly, saving the supermarket. It’s all very silly and random, and makes for some very funny results. This is what happens if you fail a level (which will happen a lot). It’s fine though, as you get to keep on trying until you figure it out. The game takes around 4 hours to complete to 100% on every level and round, which is a decent amount of time for a game this cheap. This can be extended with free DLC, which can be accessed by the main menu. I haven’t had a chance to try any of this DLC out yet, but I can imagine it’d be just as good as the rest of the game. There is also a mode for making and designing your own levels, which seems pretty intense and just as flexible as the main game. Overall, McPixel is a fantastic game from developer SOS, and I recommend it to everyone, especially right now whilst it’s on sale on Steam. For it’s price, I believe a lot of people will enjoy themselves, and if they don’t, well it’s the price of a Mars bar, so get over it. I actually played this game pretty thoroughly to find everything and I was pretty satisfied with my findings. Having this kind of sense of humor, sometimes, myself, this game holds kind of a special place in embracing that and still being a decent title.